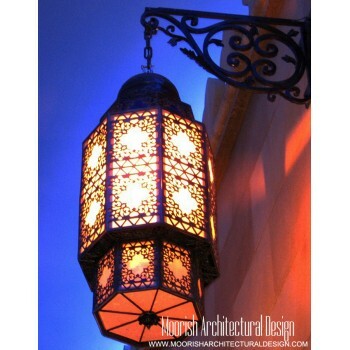 Shop our exquisite selection of luxury Moroccan outdoor light fixtures for your patio, porch or backyard! Browse a wide variety of exterior lighting for any part of your home, hotel, resort. Nothing refreshes the look of your home like Moroccan outdoor lighting fixtures. 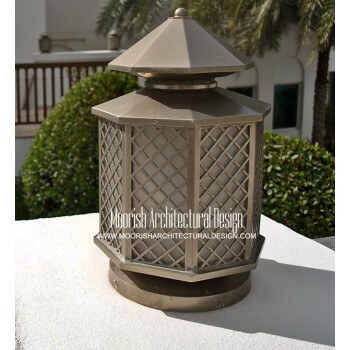 At Moorish Architectural Design, we carry a complete line of exterior lighting for porch, patio and landscape areas that can help make your home safer and more attractive. Brighten an entryway with a hanging design, add style to outside walls or ceilings, or use post lights to improve your driveway and garage areas. Discover the best Outdoor Floor Lamps for your garden, pool deck, front porch,and drive way. Add a special touch of ambience in your outdoor lounge area, outdoor floor lamps can shine a warm light on your patio or lend a whimsical feel to your outdoor landscaping & pool deck. Depending on the style, our Moroccan outdoor lamps can give off an island vibe or even bring a sense of modernism outdoors with solid shapes and sleek glow. Browse our great selection of Outdoor Lighting, Moroccan outdoor Wall Lights, Moorish outdoor wall sconces and more! Shop outdoor wall lighting fixtures at Moorish Architectural Design and illuminate the architectural features of your home! Outdoor Wall Lights can be an integral part to the appearance of your home. Not only do outdoor wall lights make the outside of your home safer, they also create an inviting appearance to an entryway to welcome your guests. At Moorish Architectural Design shop, we have all types of styles to match your décor, from traditional to contemporary to rustic. We also have a variety of shade materials and lighting finishes to compliment your home. Wall lanterns offer a warm and inviting touch to your home and can easily match many home exteriors in architectural feel, whether it is traditional, or contemporary. We carry tons of lighting finishes including bronze, copper, aged brass, and nickel silver. Outdoor wall lighting fixtures come in so many styles so you can be sure you'll find the perfect outdoor wall light fixture for your yard. Moroccan outdoor wall sconces give the exterior of your home personality and character. Our Moroccan outdoor wall sconces come in all shapes and finishes. They can also diffuse light differently – some cast a downward light, while others cast both a downward and upward light. An exterior wall sconce is mainly contemporary; however, we do have a wide variety of traditional and modern styles, along with a selection of other styles. Outdoor wall lights can cast different lighting depending on the style and structure of the lighting fixture.